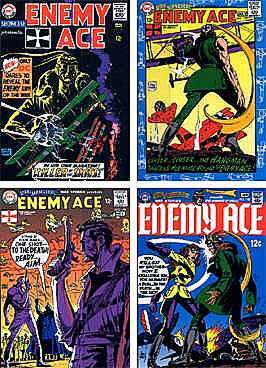 What timeliness to bring out a volume of Enemy Ace, the only American comic to regularly give the "enemy's" side of the war, just as Americans are marshalling to start yet another war. It was 1965 when Kanigher and Kubert first brought out the most novel war comic on the stands - Enemy Ace, about a German ace in World War 1. DC blurbed their comic as the only one that "dared to present the enemy side of the war!" What bluster since Enemy Ace was about a war that had been over for 50 years. 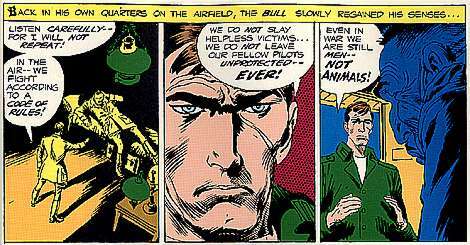 Yet it was surprisingly popular for artist Kubert's lively dog fights, the lonely monologues of the German ace and the high adventure of air-to-air combat. Kubert got the tone right, with accurate details of all the numerous airplanes that flew over the battlefields of France. Von Hammer is drawn unsmiling, slender with a thin face, and always alone. Kubert predated the Clint Eastwood look by a couple of years. Enemy Ace was crudely based on the life of the famous German ace, Manfred Von Richthofen, the Red Baron, who downed 80 planes before he was himself killed. Hans Von Hammer, the Hammer from Hell, also flies a red tri-winged Fokker DR-I and he is continually referred to as the "human killing machine". Kanigher wanted to write about war as a duty with both sides defending their nation. His airmen were like knights of old, bound by honor and chivalry to fight as officers and gentlemen. Kanigher's view of fairplay was soon to be upended by calculating pragmatism. As Vietnam drew closer in '67 and '68, Kanigher was already adding "superhero" type characters into his stories - an opponent called the Hangman who wore a hangman's mask with a noose around his neck. The comic's realism was giving way to the market's dictates and perhaps also the realisation that war was no longer fought with much chivalry as evidenced by the nightly news reports of the Vietnam War on television. The nature of war has changed since WWI. Today's battlefield is hopelessly one-sided. An imperial power holds all the superior conventional weapons leaving its opponent only with guerilla or terrorist tactics. There is no sense of chivalry for an officer who pushes buttons to launch missiles while he is safe far, far away. Air war today is all about superior firepower, speed and intel. Kanigher wrote one powerful line. In explaining the code of conduct in war, Von Hammer tells a fellow officer, "Even in war we are still men - NOT ANIMALS." Weapons of mass destruction offer a God-like power. To wield it is to no longer be men.